Last week's Newsweek's cover story was about celebrity. Specifically, the whole Tiger Woods blech. Now, I didn't know what had happened until about two days into it. I am that sports blind. This is not to make any kind of great Luddite, "I don't watch TV! I don't pay attention to gossip! I'm above the frickin' fray!" claim. If it had been Leonard Nimoy, Corey Doctorow or the Mars Rover caught in a tabloid affair, I would have known in 10 seconds. I just really, really pay no attention to sports of any kind. The Newsweek article, though, was kinda interesting. In it the author (sorry, don't know... can't find it on the site) makes a basic claim that celebrity is a kind of narrative that we all (mostly) find interesting in and of itself. Brad and Angelina do interesting things as part of their jobs (acting, mostly), but are far more interesting as characters in a great, unscripted (mostly) drama of their own lives. The author makes the claim that celebrity is a 21st century art form. OK. Though I disagree about the 21st century thing. We've had mass celebrity at least as long as we've had mass media (see "Charles Lindbergh). The idea that the parade of famousness is a "thing" itself doesn't really move me. Yeah. Sure. We like drama, melodrama, comedy, satire, fable, etc., whether it's served up as fiction or news. What did get me thinking, though, was the idea that we sit up and pay much more attention when the objects of celebrity do something that gets them in trouble. Like Tiger Woods. All of a sudden, lots of people (myself included) who knew Tiger's name, but didn't really give a tinker's cuss about the guy are now sitting up straight and going, "Really? Really! He did what? With whom? And his wife had what?" Why is "Tiger Screwed Up" so much more interesting in the celebrity drama than "Tiger Keeps Doing those Great Tiger Things that Made Him So Famous to Begin With"? I think it's two reasons. First, allergies. My wife is deathly allergic to honey bee stings. Seriously deathly. Like, if she gets stung and doesn't jab herself with her EpiPen in like 10 seconds, she could die. And you probably know someone (or someone's kid) who has serious peanut allergies. Eat a Peanut M&M and go into anaphalactic shock. Fun! What's this got to do with celebrity? Well, you don't pay any attention to honey, bees or peanuts... until you or your kid is massively allergic to them. They're part of the scenery of everyday life. But dishes with honey make my wife's tongue numb, and if she eats enough of something before realizing there's honey, her throat swells up. More fun! So... between that and my various migraine triggers, we spend a lot of time reading food labels. The point being this: celebrity screw ups are interesting because they're a kind of allergic reaction. If you're famous for being a role model of some kind (Tiger), then screwing around is going to make you swell up, get all puffy and possibly die (metaphorically speaking). If an actor or singer had experienced the same incident Tiger did, nobody would care. Musicians and actors aren't generally famous for being Good Guys. They're allergic to being ugly (Britney with no hair). And a severely allergic reaction is, frankly, kind of scary. So we react. We pay close attention. We, essentially, diagnose. What did he do? With who? Where? And did she know? We're trying to determine if this is a fatal reaction. Our relationship to celebrity is as consumers. And if the product has been killed (for each of us individually, or for everyone paying attention), we need to know. It's a kind of social-cannibalistic food safety issue, I think. At the termination of this sentence I started, and for a moment, paused; for it appeared to me (although I at once concluded that my excited fancy had deceived me) -- it appeared to me that, from some very remote portion of the mansion, there came, indistinctly, to my ears, what might have been, in its exact similarity of character, the echo (but a stifled and dull one certainly) of the very cracking and ripping sound which Sir Launcelot had so particularly described. It was, beyond doubt, the coincidence alone which had arrested my attention; for, amid the rattling of the sashes of the casements, and the ordinary commingled noises of the still increasing storm, the sound, in itself, had nothing, surely, which should have interested or disturbed me. I continued the story. I've always heard this literary device called "breaking the frame." When a character experiences movement between his "real" world and an internal fictional world, we--as readers ourselves--find it easier to imagine that movement might similarly occur between our really real world and the fictional world we're enjoying. It's a kind of transitive property of fiction. When a celebrity breaks from his/her normal mode, we experience a similar framing shift. We see them outside of the narrative that made them famous, and that gives us (probably subconsciously) a certain frisson of expectation and excitement. If it is possible for Tiger to slip, almost instantly, from "Millionaire Golf Endorsement God" to "Shabby Womanizer," then... maybe... there's a chance for us to shift from "Working Stiff" to... ??? Who knows? That's the wonder of it. Between the fascination of watching an allergic reaction, and the dramatic tension of frame breaking, we're almost helpless to turn away from the spectacle of celebrity crashes. We want to both diagnose what went wrong, and apply the results to ourselves. If the mighty can fall, perhaps the meek can also rise. In 2006, I wrote a post called The UnGrinch 25; a list of ideas on how to keep the fun, spirit and joy in your holiday season. In 2007 I doubled down on the happy happy with 50 ideas. I can't keep up with a geometric progression like that, or by 2018, I'd have to do 512,000 ideas. So last year, you got 60. Seems right to crank it up to 75 this year. New items are in purple for those of you who have already done all 60 from last year. 1. Make a family calendar. Pick a theme or use pics of your family. Fill it with all the important family dates; birthdays, anniversaries, etc. Include a weird or interesting events from Chase's Annual Events. You can make monthly calendars using MS Publisher, or the ever-free and wonderful Open Office. Good to have, good to give. 2. Create your own ornaments. My favorite, as a kid, was to take a styrofoam shape (bell, star, even a simple ball), and stick a bajillion sequins to it with pins. Pretty. Shiny. And it keeps kids busy for hours while you do other holiday nonsense. Another ornament idea (bonus!) is to take beads (I like the shiny, little, star-flowery shaped ones) and string them along a piece of craft wire. When you're done, you end up with an ornament that's also a bendy toy. 3. 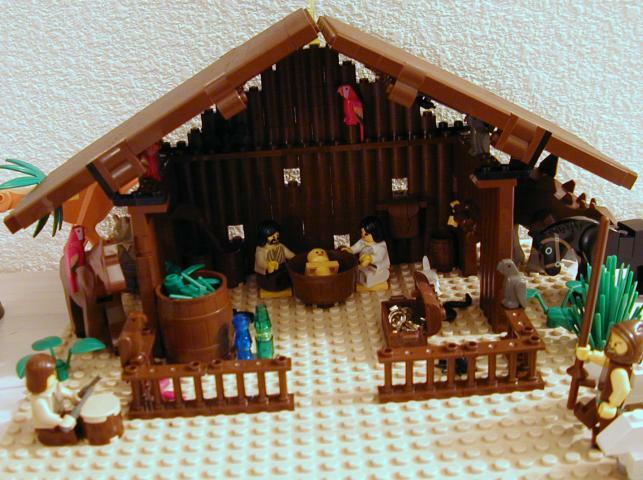 Lego nativity scene. 'Nuff said. 4. Toys from tots. There are many organizations that gather up toys for kids who don't have them. And that's fantastic. But kids also love to make and give stuff around the holiday season, and may not have the resources. Organize an effort to provide a crafty sort of event where all the necessary parts and instructions for making a neat holiday gift are available to a group of kids who otherwise wouldn't have access. My bet is that if you or your organization provided the stuff and the supervision, your local, public library could help you find a place to do it. 6. Decorate somebody else's space. Carefully. Tastefully. Always within the bounds of office rules/etiquette and the law/fire-code. But how nice would it be to enter your office (cube...) and find a wee, unexpected holiday trinket? Totally anonymous. Or to come home and have a strange, lovely wreath hanging on your lamp-post? Put a small, stuffed penguin with a Santa hat on someone's dashboard today. 7. Group shoebox calendar. Warning: takes planning. Everybody in your gang (family, office, church-group, etc.) brings in enough shoeboxes to make 25. Everybody puts something in them to help decorate the common space. Wrap them (and keep the innards secret), then randomly assign numbers 1-25 to them. Or more or less if you're doing a non-religious thing. Do 31 and make it a "New Year's Calendar." Whatever. Then, on each day, get together as a group, open the appropriate box (take turns, now) and use it to brighten the day and make the place niftier. 8. Bad Mojo Wreath Voodo. OK... this one will probably not go down well for many church youth groups... but it's meant with a sense of humor, so chill out. Have everyone in your gang (family, group) write something that bugs them on a piece of colored paper that matches (or not) the cheapest, driest, most flamable wreath you can find. Decorate the wreath with the slips of nastiness. On the day of celebration, burn (or otherwise destroy in a more work-friendly manner) the Wreath of Spite. Celebrate the destruction and release of the things that bug you. 9. Holiday bird-feeder. I like bird-feeders. So do my squirrels. Oh, well... But mostly they either look like weird plastic contraptions or little A-frame tenements. Help a bird out. Decorate a special bird-house/feeder for the holidays. 10. Odd snow sculpture. We all make the snowmen. Yes, yes. Lovely snowmen. Do it up different this year. Make a snow carving of your company's logo. Never mind. Don't do that. How about a UF-SNOW? Unidentified Freezing Snowcraft? Or a guy climbing up your front tree? Or a giant hand? Don't be overly critical of your work... just get some friends together and get stupid with the snow. 13. Advent destructo-calendar. Rather than pop little toys/charms out of an advent calendar every day in December before Christmas, instead build a model or print a picture of something you'd like to be done with. Kind of a pre-New-Year's-resolution game. Then divide the thing up into 25 (or 31 if you want to do the New Year gig), and on every day in December, pull that sucker down! 14. Holiday spaz origami. People get so bent out of shape (ha) about making perfect, tasteful little origami things. That's way to obsessive for holiday time. Get some colorful paper and start folding, cutting and pasting things together. Make a mess... but make it a glittery, shiny mess. Find order in the chaos. Or not. Enjoy the 2D-becomes-3D magic. Discover what shapes lurk in a crumpled up ball of tinfoil. Make little birds out of the covers of old magazines and spray paint them gold and put 'em on the tree. Don't overthink it. You'll discover more shapes and more new models if you just, well... get spazzy. 15. Lights on other stuff. People always put lights on their house. Now, I love that, and I don't want to discourage it. But one year, back when we were living with my folks in Boston, we put lights around our lamp post. Got more compliments on that. You got a mailbox? Light 'er up! Koi pond? Let it glow! Heck, why not just try a new pattern of lights. Like, just hang them all randomly out an attic window so it looks like your house is puking lights. Maybe not. Then again, what the heck. 1. Rewrite "The Twelve Days of Christmas." Let's face it, hollering, "Fiiiiive gooolden riiings!" is way fun. Way, way fun. You can not resist, so don't hold back. But what's even more fun, is hollering your own family version that only you and the clan know. Because, really... doesn't singing about how your true love gave to you... "eight maids a milking" make you a bit... uncomfortable? I mean... dude gives people for Christmas? That ain't right. Bob and Doug McKenzie not withstanding, your own version will be more fun. My son, just this morning, was singing, "Fiiiiive gooolden delicious!" Hilarious. 2. Indoor snow-ball fights. We spent two years of my childhood in California, after having lived in Boston, and with parents who grew up in New York. Snow ball fights are a required element of winter joy. Indoor? Substitute aluminum foil balls, rolled-up socks, styrofoam (messy), newspaper wads, etc. instead of snow. The point is to throw things. Banzai! 3. Mall caroling. It's hard to find places to carol. Outside can get very cold. And, with kids in tow... well, it's tough. Check with a couple local malls and arrange for a time to invite anyone who'd like to participate to meet, get song books, and walk around the mall singing. See if you can arrange for an accordion player. Seriously. It adds to the cheer. If you want to charge a couple bucks to participate and also collect donations from listeners and then give the money to a local toys-for-tots charity, that makes the whole deal more righteous, and more palatable to certain civic types. 5. Insane White Elephant. Last year, John Moore from Brand Autopsy set up an excellent White Elephant Blog. It ain't up this year. Oh, well. The basic principles of a White Elephant gift exchange apply, but anyone who has their gift taken can keep stealing from anyone who hasn't yet had their gift stolen that turn. The more people playing, the more fun. No "deceased" gifts in this version, either. Until you've had a gift stolen on any given turn, it's in play. 6. Make-a-wreath party. OK... this is a combo craft/entertainment idea. So sue me. We used to do this at the church I grew up going to. You show up with the basics of an advent wreath (styrofoam torus and a bunch of evergreen branches), and the host provides all kinds of add-ons; candles and holders, bells, ribbon, holly, berries, etc. Good times, and a wreath to take home, too. 7. Semi-formal holiday martini party. In the old days (the 1950's), people dressed up to go to holiday parties. And while this may still hold true for some work-sponsored events, more and more often, work holiday parties are tired, dull affairs. Most of the ones I've been to are, anyways. So, on your own, get some friends together and dress all high-class, and drink funky, fun martinis. No reason grown-ups can't have grown-up fun around the holidays, too. 8. Remembrance time. Around the table, have family members or friends recount their best (or most interesting) holiday memories. Yes, it's corny. But corny is good during this time of the year. Embrace the corn. 9. Tell your faith's holiday story with sock puppets. You never real own a story until you tell it. I know this, because I played King Nebuchannezzar in a 4th grade production of, "Cool in the Furnace." I now own The Firey Furnace. Be that as it may... You can hear the Christmas, Hanukkah, Kwanzaa, Yule, Solstice, etc. stories again and again. But until you write out a script, make your own sock puppets for the players, fashion a stage from a major appliance crate and put on a show for the grown-ups... do you really grok the holiday's true meaning? I think not. You can keep going with the original story, substituting other zaniness, or switch over to the one from the card. Whichever seems like more fun to you. And, yes, this is kind of a holiday version of TaleWeaver. 13. Red and green food party. If your last name begins with A-J, bring red food. If it begins with K-T, bring green food. U-Z? Silver or gold. OK... maybe not. 14. Poetry party. Get some nice paper and pretty pens. And yellow legal pads for first drafts. Put holiday words on scraps of paper and put 'em in a hat. "Joy," "Presents," "Egg Nog," "Sledding," etc. Everybody gets a word and writes a poem, which somebody else gets to take home. 15. Host starving artists/musicians. Find a local artist (or two) or musician (or three) and invite them to your office, church, Rotary, etc. holiday party. Ask them to play or bring their art for sale, and introduce them around. Art/music are tough businesses. Artists/musicians make cool guests. Extend them a happy holiday hand, and give your friends the gift of culture. 1. Make your own envelopes. A dear friend of mine (Hi, Susan!) once sent me letters every few months in hand-made envelopes. Hers were made from interesting magazine ads. How cool is that? If you want to get fancy, do a search on the Internet for "make envelopes" and such. But the easiest way is to get the envelopes that go with whatever cards you're mailing, carefully bust 'em apart, trace them on funky paper (magazine pictures, wallpaper, wrapping paper...) and then cut, fold and glue (or double-sticky clear tape) them together. People may expect hand-made cards. Nobody expects the Spanish Inquisition. Or hand-made envelopes. Festivisimus! 2. Photoshop your kid(s) into other (classic) pics. I first saw this done to Raphael's "The Sistine Madonna, Detail of the Angles" painting (shown). The point is to have fun and take a picture folks will recognize and include people they will recognize. It doesn't have to be a serious pic, either. I would think that your kid climbing the Empire State Building to put a star on top would be hysterical. Use this instead of a regular picture-of-your-kids card because... well... because it's goofy. Combine with #9, below, for best effect. 4. "Puzzle Party" cards. Take, buy or make a nice picture and turn it into a jigsaw, either yourself or at Kinkos. Mail one piece to each person you're inviting to the party. When they come, they add their piece. Depending on how corn-ball you are, you can hold forth on how we're all a part of the holiday panorama of joy, etc. etc. It also serves to increase the guilt factor that motivates people to come to your party, since if they don't... their piece will be missing. Ha! 5. "Family News" cards from the future. I love this one. Lots of families I know write a very nice update about what's been going on over the last year. It's nice to hear, but... mostly it ends up being, "Dad's still working and maybe going a bit more stir crazy. Same for mom. The kids are in school and are a year older." Yawn... I like the idea of fast-forwarding a bit and writing your "Holiday Family News from 2025." Keep it just as straight-faced and boring, but mention which dimension Mary got lost in on the way to work this time. Talk about how the Martian embassy lost your passport on your 2nd honeymoon cruise, etc. etc. Much more fun. Cloning humor goes over big in this one, too. 6. Mystery cards. Send a really nice holiday card, maybe include a gift certificate, but with no indication of whom it's from; no names, no return address, etc. Why? To bug the crap out of somebody you love. And isn't that what the holiday season is all about? 7. Return-reply cards. Send people a card with a self-addressed, stamped envelope or postcard inside to send back to you. Put questions on it you'd like answered, like... what do you want for Christmas next year? How the heck are ya? Which holiday movies did you see and like or hate? People love to be interactive. Give the gift that gives something back to you. 8. Custom mouse pad card. They will throw away the picture of your kids. But if you put that picture on a custom mouse pad... it's a keepsake. 9. Nice, custom cards. While we're visiting Cafepress.com. ... You can go to the drug store and have any photo turned into a card. And they sure look like you did just that. But if you take a few more minutes, you can actually have custom cards printed out for you. Ones that look like cards. Which is nicer, you must admit. Combine this with #2, above. 10. Origami cards. Do your regular card, but include a piece (or more, if necessary) of origami paper and instructions for making an ornament, decoration, etc. Your local library has holiday origami books, I bet. Again... the point is to do something different... with a little extra un-Grincy flavor. 13. Mad Men card. Best. TV show. Ever. Use the "Mad Men Yourself" application to make yourself over as a 1950's advertising executive, flunky, secretary, etc. Then send that out on your cards. Fabulous. 14. Mystery card. Send someone a lovely card with a hint or clue about who you are... but not the whole enchilada. Tell them that the next clue will come in a Valentine's Day card. Or something. Then don't forget. 15. Color-it-Themselves-Cards. Get some card stock for your ink jet printer. It works fine, really. I do it all the time. Create a line drawing, or scan in a picture and then trace the edges. Whatever. What you want, when you're done, is a card with pictures that look like they're from a coloring book. Outside, inside, both... go nuts. Then mail it along with a pack of 3-5 tiny colored pencils. When it arrives, your friends/family will have a neat little activity to share with their kids. 1. Surrogate shopping party. So many of us have someone or several someones on our lists that are impossible to shop for or that we just have a mental block on. Fine. Get together for dinner and share an equal number of those folks with each other, along with a few details and a dollar ceiling per gift. Then release yourselves into a mall with a time limit. Then get back together and share the swag. I guar-ohn-tee that your friends will find stuff for your hard-to-getters that you'd never have thought of. If it ain't right? Well, 'tis the season to return stuff. 2. Thought gifts. They say, "It's the thought that counts." OK. So, this year, only give thoughts for the holidays. Make this the year that you and yours agree to take whatever your budget for gifts was and either give it to a charity or stick it in a savings vehicle; your call, I'm not preaching here. But for yourselves... take the time to actually say the things you haven't said. Give "the thought" behind the gift. If you're a spiritual person, pray or meditate on the subject for a bit. Do it in a card if you like, or via email. Don't make the logistics as much of a pain as shopping/wrapping/etc. That's not the point. But all the major religions that are celebrating this time of year have gift-giving as a central notion not as a potlatch per se, but as a metaphor for love, friendship, community, etc. 3 Archie McPhee. This idea is a straight-up pimp for the Jumbo Mystery Box from Archie McPhee. I get one of these every year (although this year I have been strongly advised that the ladies want something non-McPhee in their stockings... geez), and use the contents for stockings, Secret Santa, random giftings, prizes for students, etc. You never know, around holiday time, when a bunch of Hindu god finger puppets, glowing eyeballs or rampaging Hun toy soldiers will come in handy. 4. Gifts for the future of the group. Have everybody get everybody something that will only really "work" when you get back together. Pick a group-y activity like a picnic or game night, and have everyone get/give gifts that will be brought together again each time you do that thing. 5. Recommendations or reviews. I get lots of gift certificates. And that's cool. But it still means I need to figure out what I want to get with the thing. If you give someone a gift certificate (especially to a book or music store/site), provide a list of 5 or 10 ideas that you think they'd like. Write little mini-reviews of books you've read, movies you've seen, etc. that made you think of the person. Make the list fun, funny or serious... but it will add personality and thought to what can seem like a somewhat generic offering. 6. Make part of the gift yourself. Homemade gifts are special, when they come from adults as well as kids. I recently received a CD from a friend, and it was wrapped in a handkerchief that he'd tie-dyed himself. How cool is that?! If you give someone a coffee machine, create a custom mug for them, too. 7. Food with gifts inside. I don't know why this is fun, but it is. Make sure you warn people, and make the gifts obvious (small gems can be a choking or tooth-breaking hazard). Seal stuff in zip-lock bags to preserve the food and the toys. Put something in the Jello (action figures?) that will make digging out the prize as much fun as playing with it. 8. Gifts with a story. Write a fictional story about how the gift you're giving came into your hands. Make it funny, sweet, odd, implausible... whatever. It will make the present more memorable. 9. Don't overthink. We spend so much time (well, I don't, but "we" do) trying to figure out the "perfect gift" for people. Unless you're sweetie is waiting for a ring, or your 8-year-old will DIE without a particular Lego set... there ain't no such thing. Part of the fun of gifts is getting something you wouldn't ever have bought for yourself. If it wasn't, we'd just give each other money. Bleh. So give something odd and unexpected. I mentioned Archie McPhee before. Another great site full of fun and different ideas is the Quincy Shop. Very unique stuff, in a wide range of prices and styles. Really fun. This year, somebody better get me a Buddha Board Zen Art thing, or I'm a-gonna cry. I got most of last year's stocking stuffers from their "Unique Gifts Under $10" section. Their selection and service gets the Andy Havens' Seal of Wow! That's Neat! 10. Share kids. Childhood is a big part of the holidays; both our own and our kids'. If you don't have kids and are friends with someone who does, offer to babysit so that they can go out and shop, and then do one of the craft things above. If you do have kids, and know folks that don't, invite them over for an event where the kids will play a part. Holidays go better with runts. 11. Gift from your past. Find something that was highly meaningful to you as a child, or in the past, and give it to someone along with the story. Could be a book or movie or a type of clothing. Could be the board game, "Risk," if you're a giant geek like me. 15. Most beautiful umbrella ever.The National Cathedral in Washington, DC makes an umbrella with the pattern of its Rose Window on it. Absolutely stunning. When you use it, if you look up, it looks like you're inside a stained glass window. Makes a rainy day much nicer. 13. High-quality photo book. Plenty of places (Viovio and Lulu come to mind) will walk you through the process of taking some of your digital photos and putting them into a nice book. Coffee table book of your nephew's birthday party? Awesome. 14. Turn someone's handwriting into a font. There is software to do this, and online services, too. Might take some time up front to collect somebody's A-Z's. Also, for someone like me whose handwriting is garbage... not so great. But for somebody out there... fun stuff, having your own font, eh? 1. Start a bizarre, personal holiday tradition. I heard somewhere (can't find it online, sorry... it may be apocryphal) that Amy Grant's family explodes their Christmas tree after New Year's Day with fireworks. I'm neither hot nor cold on Ms. Grant, but... that's flippin' awesome!!! So many of our holiday traditions are either copped from cultures that really aren't our own anymore, or have been entirely kidnapped by the media/mercantile world. Why not invent a new ritual that's just for you and your family? Stuff a sock with toys by the fireplace? Why? I sure as heck don't know. How about, instead, everybody in your family writes one line of a nativity poem. Or fight some gingerbread man wars. Or make advent candles from last year's used crayons. At my house, we've now been playing street hockey the day after Christmas for several years with all the in-laws. Why? Bob wanted to one year. After three years... It's a tradition! 2. Overtip, ridiculously, at least once. Food service is tough work. And around the holidays, it's even worse. People are out-and-about, running like mad, full o' holiday spirit, and, often, not very nice to the wait staff. And because we're spending more than we should on various baubles, bangles and beads... we're often a bit penurious when it comes to the everyday stuff. Which hurts the folks whose livelihood depends on our largess. So. At least once, between Thanksgiving and New Year, when you get good service and a nice smile with your meal... leave a $20 tip on a $13 lunch meal. Or, what the heck... leave $50 to cover a $22 dinner. Or $100 for a cup o' joe. Seriously. Don't make a big deal out of it. Do it, as the scriptures say, "In the dark." But do it. You'll make somebody's whole season. 3. Start a yearly journal. Very few people keep a journal. I'm a professional writer, and I don't. I'm supposed to, but I write at work, and I blog, and I write poetry and fiction and, and, and... So I've never had a daily journal. But what I do have is a notebook that I take out about once a year. Often around the holidays. And, in my case, I write in it the names of people -- everyone I can remember -- that I've met during the last year or so. And, of course, I go back and read the earlier entries and reflect on how lucky I've been to have known so many wonderful people. The names are my "touchstones" to the past. The names are bookmarks in my memory, because people anchor the most important events in my life, I think. Anyway... that's what's in my "annual journal" for the most part. Yours, of course, can be anything you want. 4. Share a resolution. We don't keep our New Year's resolutions, for the most part, because we are not really accountable to ourselves. We cheat and look the other way. So share a resolution with a friend or family member; let them hold you accountable, and vice versa. 5. Share a resolution. No, this is not a repeat. In this case, I mean make a resolution that includes another person. For example, resolve to have a game-night once a week with your family, or to go for a walk 3 days a week with your spouse. Resolve to send an email back-and-forth at least twice a month with a friend you don't see much anymore. Resolve to cook healthy for me, and I'll cook healthy for you twice a week. Resolve to help your boss with his annoying habit of not taking minutes/notes at meetings, and he can help you with your attempts at better process management. So many things that we want to accomplish are impossible alone. Resolve to be better together. 6. Visit someone else's ceremony. When I was in confirmation class as a young Methodist swain, our pastor took us to a Passover Seder service at one of the nearby Jewish temples. It was a great way to learn about the similarities and differences between my faith and that of my Jewish friends, and to drink wine as a 15-year-old. That specific holiday won't work around December... but you get the point. Find out what and how others are celebrating around this time of the year. You'll end up experiencing your own traditions more deeply, I guarantee. 7. Take someone to a performance of Handel's "Messiah" who's never been. There's a church in your area putting it on, I guarantee. If not (some guarantee, eh? ), rent a version from the library. It's truly one of the most beautiful, moving pieces of holiday music you can experience. Sharing it is a great gift. 9. Give to a charity you don't normally connect with. Stretch a bit. If you mostly give at church, find a secular charity that does something you agree with. If you tend towards issues of hunger, try education. I'm not saying don't do the stuff you usually do... but find out about a new one. When our giving becomes rote, we lose something of the original reason we were moved to give. Get out of your comfort zone and find a new way to share. 10. Forgiveness. One of the worst barriers to experiencing spiritual, holiday joy is the sense that we are not worthy. Whether directly or indirectly, too much gift giving is often a substitute for the resolution of actual issues. And one of the issues that really can weigh us down this time of the year is a grudge. Whether you're holding one against someone else, or they're mad at you about something... take care of it. If it's so far in the past that the person is dead, moved on, out-of-touch,etc., then talk to a friend, therapist or confessor of some kind. Get rid of it. I don't care what your religion is or if you have none. The burden of unforgiveness is a strain on the holidays for us all. Lose that, and all the other holiday stuff will be much, much brighter. 13. Share a booth/table with strangers. At least once during the holiday season you will be seated to eat at a restaurant where there's a line behind you. People still waiting to eat. You know. And if you're two people, and you are going to be seated at a table for four, turn to the next couple in line and say, "Hey... why don't we share a table. Not the bill or anything. But we can eat together. Save you a little time, and we all get to meet somebody new." Use your own words. 14. Pay the toll for the car behind you. Between December 1 and January 1, every time you go through a toll-booth, use the lane with the guy in the booth, rather than the correct change lane. When you pull up, hand the guy enough money for two tolls and say, "I'm paying for my friend behind me. Wish him a Merry Christmas when he comes through, ok?" 15. Sing carols (or any songs, really) while doing chores: I sing while I do the dishes. It's a rule. I have to, or it's no fun for me. I've tried while doing laundry... and I'm getting there... but that's an even more unfavorite chore of mine, which makes it harder. But I'm trying. You'll find, after awhile, that you don't mind the chores as much. Well, that's it for 2009. My gift to you, along with wishes for a happy and safe holiday season. Don't let all the bad news out there get you down. The universe is a wonderful place, and the holidays are a great time to remember and celebrate all the joys we can share. Now, get out there and ring a bell like you mean it! An essay at Edge.org called, "The Age of the Informavore." We'll get to my thoughts on the essay in a minute. My first thought was, "Wow. This guy doesn't make up new words very often." He is German, and English is his second language... so mad props to him for writing an interesting essay in another language. I can't do that, so I don't mean to be supercritical of his writing in general. But it really should be, "Infovore." Technically, in a Latin-root sense, he's correct. The Latin, "informare," means to "give form to the mind" or "teach." The root is "inform" not "info." But we use "info" in English as the short-form of the noun "information." And we tack it on to other things to come up with "infotainment" and "infolicious" and "infotastic." And by "we," I mean of course, me. We are apparently now in a situation where modern technology is changing the way people behave, people talk, people react, people think, and people remember. And you encounter this not only in a theoretical way, but when you meet people, when suddenly people start forgetting things, when suddenly people depend on their gadgets, and other stuff, to remember certain things. This is the beginning, its just an experience. But if you think about it and you think about your own behavior, you suddenly realize that something fundamental is going on. There it is in a nutshell. The tools we've been using for a couple hundred millenia to give our physical bodies leverage over our environment are now giving way to mental tools. I would agree that we depend on outside entities to manage, store and process our thoughts. But I'd argue that we've been doing so, to some degree, since language was invented. I don't process every thought I have need of; I often let others do lots of my "thinking" for me. There are people at work, for example, who are much better versed in all kinds of skills, knowledge and wisdom which I have no regular need of, but enjoy regular access to. I can walk 20 steps to the legal department and ask them questions. I can pick up my phone and ask our IT folks questions. I can follow instructions, and then promptly forget what I once "knew" for the 30 seconds it took me to interact with that information in my own sphere. Obviously writing and printing aid that process. I don't have any idea what the capitol of Assyria was (though I do know my favorite color). If I need that information, I look it up. Quantitatively different? Sure. But we've been doing these things for a long time. Hmmm... I'm back, a bit, to my original argument: "what is important for me" hasn't always been decided in my brain. It is often decided by my boss, my wife, my government, students, son, friends, doctor, lawyer, traffic cop, plumber, etc. Thinking is often a group activity. But now, when you have a generation â€” in the next evolutionary stages, the child of today â€” which are adapted to systems such as the iTunes "Genius", which not only know which book or which music file they like, and which goes farther and farther in predictive certain things, like predicting whether the concert I am watching tonight is good or bad. Google will know it beforehand, because they know how people talk about it. What will this mean for the question of free will? Because, in the bottom line, there are, of course, algorithms, who analyze or who calculate certain predictabilities. And I'm wondering if the comfort of free will or not free will would be a very, very tough issue of the future. Hold on... that's not thought, per se. That's decision making and pattern recognition and cultural zeitgeist stuff which have been cognitively offloaded from individuals in many forms for millenia [note: need a word for "cognitive offloading." Will come back to that]. When I went into Tower Records in 1989, I didn't have a universe of choice and only mine own wee haid to sort things out. There was an entire ecosystem of publishers, buyers, merchandisers, store workers, marketers and friends to help me narrow down my millions of choices. Sometimes I went in for a specific album, having heard it on the radio (cognitive offload!). Sometimes a friend would want to point out some stuff they'd heard or bought recently (cognitive offload!). Sometimes I just browsed and looked at stuff on end-caps (cognitive offload!) or with cool covers (cognitive offload!) or that were being perused by cute girls (non-cognitive offload!). Is that any different, on a "though-level" from iTunes or Amazon recommendations? Not to me. I still get to make the decision. It's just that now I get to make a decision using more (or different) decision engines. It may be "turtles all the way down" as far as the origin of the universe, but when it comes to choosing music, TV or movies... my choices are rarely going to be made solely based on what's in my head. Why? Because those are "social thoughts." Always have been.What do I want to eat for dinner? Depends on the folks with whom I'm eating. What movie is OK to take the boy to? Depends on what my friend, Bob, says. Bob's got good taste when it comes to parsing the OK-ness of movies for young lads. How much baking soda goes into the pancakes? Betty Crocker, help a guy out. It's all external cognition. The question of prediction will be the issue of the future and such questions will have impact on the concept of free will. We are now confronted with theories by psychologist John Bargh and others who claim there is no such thing as free will. This kind of claim is a very big issue here in Germany and it will be a much more important issue in the future than we think today. The way we predict our own life, the way we are predicted by others, through the cloud, through the way we are linked to the Internet, will be matters that impact every aspect of our lives. Again... let's wait a second. Prediction isn't cognition either. Or it is, at best, a very specific type of cognition. And we know from quantum physics that observing a system changes it. So you can try to predict human behavior -- and I will agree that access to holycrapabytes of more and more personal data may provide some frightening attempts at prediction -- but, again, we do that now. I'm in marketing; it's kinda what we do. Predict and, to a degree, direct behavior. Until, however, we can solve traffic jams and make sure that there is always some Life Cereal on the shelf at Walmart (what the heck? it's popular! stock up, you guys! ), I will be more worried about ham-handed attempts at prediction than at somebody actually knowing what's going to happen (see: Barak Obama's chances to become president back in the primaries). Digital Darwinism, Communism, Taylorism. Not for shism, I don't think. That last, I assume, means that we can't any better (or humanely) manage cognitive workflows than we can industrial or technical ones. We end up with dehumanization, etc. but on a level of thought-processing rather than work-processing. It's a kind of catharsis, this Twittering, and so on. But now, of course, this kind of information conflicts with many other kinds of information. And, in a way, one could argue â€” I know that was the case with Iran â€” that maybe the future will be that the Twitter information about an uproar in Iran competes with the Twitter information of Ashton Kutcher, or Paris Hilton, and so on. The question is to understand which is important. What is important, what is not important is something very linear, it's something which needs time, at least the structure of time. Now, you have simultaneity, you have everything happening in real time. And this impacts politics in a way which might be considered for the good, but also for the bad. Because suddenly it's gone again. And the next piece of information, and the next piece of information... And they all should be, if people want it, shared. And all the thoughts expressed in any university, at this very moment, there could be thoughts we really should know. I mean, in the nineteenth century, it was not possible. But maybe there is one student who is much better than any of the thinkers we know. So we will have an overload of all these information, and we will be dependent on systems that calculate, that make the selection of this information. Respectfully, I don't buy it. Hunting is different than gathering. But it ain't new to us. We're back to my whole thesis on information hunting vs. gathering. Are the systems different now? Yes. Clearly. Are they going to produce (and have already produced) enormous shifts in economies, politics, culture, education, entertainment? Yes, of course. But to say that in the 19th century you could know what thoughts you should know? Sorry, but... no. Just no. Lots less input? Sure. I buy that. Remember that in the 1800's, even through the late 1800's, something like 98% of the world's population was working on farms. To suggest that they could process all the information available and decide what was important is only true because, for the most part, there was so little information to be accessed (relative to our time). But, even then, if you wanted to "know what is best to know," you would have had to spend a lifetime reading and talking and studying. All of it in the midst of others, who would help you do so. Information has always been there. We now have more meta-information and more choices about which information to spend time on. What did Shakespeare, and Kafka, and all these great writers â€” what actually did they do? They translated society into literature. And of course, at that stage, society was something very real, something which you could see. In Shakespeare's time, "society" in England -- an island the size of, well, England -- would have been about ten different societies. Most people never traveled more than 20 miles from the town of their birth. Religious and cultural activities varied greatly from region to region and the language itself was still more a collection of dialects than what we'd recognize as English. Within another 100 years, Shakespeare and the King James Bible would help provide a unifying, literate center for English on a going-forward basis. But, by then, the explosion of printed material would probably have meant that no one person could ever have read (much less fully grasped or memorized) all the works being printed. And that's just in English. You will never really understand in detail how Google works because you don't have access to the code. They don't give you the information. But just think of George Dyson's essay, which I love, "Turing's Cathedral." This is a very good beginning. He absolutely has the point. It is today's version of the kind of cathedral we would be entering if we lived in the eleventh century. It's incredible that people are building this cathedral of the digital age. And as he points out, when he visited Google, he saw all the books they were scanning, and noted that they said they are not scanning these books for humans to read, but for the artificial intelligence to read. I agree about Dyson's essay. Go read that. And that final point is interesting; the Google Book project did scan the books so that, essentially, they became part of a "machine intelligence," is we want to get all SciFi and call it that. Google now "knows" that of all those billions of pages, about 1,019 have the combination of the words "poison" and "banana" on them. And being able to access those very quickly is important and different and game-changing and scary and fun and helpful and weird and different. But I don't think it means what Schirrmacher thinks it means. I don't believe we are offloading key cognitive processes in a way that is fundamentally different than we do with books, experts, pads of paper and fridge notes. There are just more choices. And there are more "meta choices." My wife and I were talking about this yesterday, and she believes there is value in memorization. Multiplication tables for kids. Poetry for anyone. Vocabulary. I agreed. Of course there is. If you have nothing memorized, you'd be, essentially, incapacitated. If you don't remember the words or grammar for, "I don't understand what you're saying," you won't be able to do much. But at another level, real thinking -- the kind that leads to interesting discoveries, creativity, conversation -- is less about learning the pieces, and more about what you do with those pieces. Is a certain set of [memorized intellectual] tools necessary? Of course. Will a larger range of possible tools mean more stress about which ones are most important? Sure. But we've had to make those choices for thousands of years at this point, certainly since widespread printing came about. Now we may also be making meta-information choices, deciding not just what pieces of data to memorize, but what systems to become expert in. I'm really not trying to downplay the importance of the Web, always-on communication and media, mobile computing, large-scale search and prognostication systems, etc. etc. They are hugely important. But when we focus on (as of yet) unproven assertions about how this change is qualitatively different... we lose the ability to deal with those changes using current (or past) thought processes. How does this translate to reality? Short-term, "immediate action required" (eg, "boss needs something now" email): interrupt information hunt, deliver action. Short-term, "this is very interesting, but doesn't really require action from me:" possibly pass along to other interested folks. Short-term, "that's good to know, no action required, but further/future thought might prove fruitful:" attach metadata, breadcrumb, to-do, link, bookmark, post-it note, and file. Long-term, "this is very important, and requires action, but not immediately:" note and file for appropriate activity time. Lont-term, "this is interesting, but doesn't require any action on my part:" put in the part of my brain for interesting things that will fight, in a Darwinian sense, for long-term survival. This does look complicated, yes. And it seems almost like a computer program with a bunch of "If/then" loops. But -- as I've argued before -- I think we do this all the time. It's more like hunting behaviors than gathering, but it's already inside us, both individually and culturally. We just need to get better at it again. "Yes, but I have information overload! How does all that pointy-headed yabba yabba help me?" To be blunt, I think lots of people are in a place where they simply haven't thought about their thinking in awhile. We (folks my age and older, and even many younger people) have been raised in an "information gathering" society. We go to classes that are about "Subject A," and then "Subject B," then "C," etc. In Class A, students in Major A learn from Professor A about Subject A. Round pegs, round holes. Assembly line methodology. At work we have Entry Level Job A reporting to Manager A who does Job A and reports to Director A, all the way up to VP A. You often don't get an "information generalist" until you get to the CEO, and they usually have come up through a particular discipline. I'm not saying this is bad or wrong. It just prepares us to live as information gatherers. "Go there, to that row, in that patch of information, get the data related to your job, and bring it back and do something very specific with it." That's much different than, "The forest is there. It has everything you need. Figure it out." Schirrmacher, and many others, are -- I think -- experiencing some of the fear and uncertainty that comes with a change in environment. I don't mean to minimize it; I just think we need to concentrate on ways to become better hunters. To use Schirrmacher's term, we're already informavores. Have been since we started relying on tools, agriculture and group systems. We just need to make a transition from informasheep to informaraptors. In my RSS reader today, I came across two (seemingly) unrelated posts that ended up colliding in my mind and making me feel, well... a bit troubled about certain aspects of our glorious, technofuture. The second was a post at ArsTechnica about the re-trial a woman being charged with file sharing. I don't know much about the case. But what struck me about the defendant's testimony was that she had very poor recollection of what she did to/with her computer, when, what caused certain issues, when she was contacted by various organizations and law firms, and -- in general -- lots of stuff connected with her case. What struck me was not that she had uncertain and (in some cases) conflicting memories of all that stuff. What struck me -- especially in light of the browser Q&A video -- was the realization that *nobody* could ever have really adequate knowledge of what went on with their computer several years ago. Our computers -- and especially the Internet -- have become appliances. We use them every day for a variety of things. And we, mostly, don't understand them. 92% of us don't know what a browser is. That's OK... I'm not claiming super-genius status because I do; it's related to my job, and I'm a huge techno/computer geek. I don't really know what a carburetor is, yet I use one (I think) every day in my car. I'm not pointing blame or recommending that people "shape up" and learn about their computers. They don't need to, often don't want to, and shouldn't have to. But imagine somebody asking you, "What did you buy at the grocery store three years ago?" Or, even better, "What items did you launder together on June 19, 2008?" The defendant's testimony is confused and contradictory? Hell, my memory of what I did *last month* would be confused if you asked me a year from now, and then again a year after that. If you went back and looked at my credit card receipts or phone bill or invoices from a certain company, you'd have a *way* better picture of what I did (relative to those areas) than I do. We simply don't document our lives. And we're living more of them on the Web. A place that, in some cases, provides a scary level of fingerprint evidence of our behavior, much of which is beyond our understanding. Did you dowload XYZ on a certain day? Did your friend send you an email with an attachment? Did you back-up files from your iPod onto a hard-drive and then switch to a non-Apple MP3 player? Were you aware that the EULA didn't allow you to have files on more than one computer? Etc. Etc. Our tools aren't smarter than we are. But they do have better memory. After my recent WordPress kerfuffle, my old spam filtering plugin went away for a few days. During four days' time, I received almost 300 spam comments/trackbacks on the blog. Fun! I got the blog fixed (for the moment), got rid of the new spam, and went back and cleaned out about 1,200 old comment/trackback spams that had been sitting around on various pages, just waiting for me to get around to yanking them. In doing so, I crawled through the all the legit comments I've had over the past (almost) four years here. It was a fun hike through virtual memory lane. Some of the posts were related to timely issues, so they were nice snapshots of something linked to a particular date. Some of the comments were about posts where I tried to flesh out thoughts and ideas, and it was nice to be reminded of a state-of-mind that, in some cases, I have now changed. Polaroids of my younger brain. Neat. I set a goal, about a month ago, to try to blog at least once a day. That didn't happen. I did blog more... but some days, when you add "tired from work," "stuff to do at home" and "not really turned on by any random concepts," you get no postings. I also blame Twitter. I've been tweeting both as myself and for work (@OCLC), and something about that process feels enough like blogging to kind of scratch that itch. I've also been entertaining dark thoughts of dumping this blog entirely. It serves as an interesting vent for me... but I see less and less personal blogging out there these days, possibly because of said Twitterishness + Facebooking. The blogs I read tend to be more professional (BoingBoing) or comic (DinosaurComics) or related to specific topics (TechCrunch). Going through the comments, though, made me feel like the endeavor as a whole still has value. So I'll keep it up, even if I'm not being as profound as often as I'd like (to think). Yesterday, I discovered the lovely new "not-a-dictionary" word site, Wordnik. Simpy delightful for a verbaphile such as myself. Now, I use the drop-down search engine thingy that comes with Firefox. You know... that little box in the upper right where you can add all kinds of search engine type sites and then choose from the drop-down to search many, many services. I have more than too many on mine. Examples include IMDB, RhymeZone, WorldCat, YouTube, Metacritic and about 10 more. I thought it would be nice to add Wordnik, so I went to the drop-down to choose the "manage search engines" option at the bottom. Well, lo-and-behold, "Add Wordnik" was available as an option, too! Somehow, Firefox "knew" that I was on a site that had a search engine option that would work with their wee little drop-down, and Wordnik had done whatever it needed to -- on its first day of live service -- to make that happen. I'd never seen it as an option before, and was quite pleased. It saved me from having to go to the Mozilla site and search/add the option. Not a big deal, but I was pleasantly surprised at not having to go through the bother. So... today I decide to try out Microsoft's new search enging, Bing. I go to the site and play around. OK... it's nice. Kinda different than Google. Not sure if better or worse. Will use a bit more then decide. So, remembering my Wordnik experience, I think, "Hey! I bet there's an auto-add option for Bing in that drop-down thing." Tiny little start up? Day one of operation? Pass. World's largest software company? Been doing this for decades? Fail. In the words of Tina Fey, "What the what?!" The good news is I'm getting much better at completely tearing down WordPress and putting it back in again. Bad news is that "better" still means 2 hours of funnin' around. For a blog that's almost entirely something lower than "hobby" on my scale of importance, yet higher than, "whim," that's a bit much. I am considering porting the blog, old posts and comments and all, to Google's Blogger platform. We'll see how that shite goes.